Kalashnikov wins the Betfair Hurdle in 2018 - who takes the crown this year? "As you would expect for the richest handicap hurdle in the UK entries are strong and once again improving novices are to the fore in the betting. The Paul Nicholls-trained Getaway Trump, who will be putting the form of his splendid second in the Challow to the test, is 8/1 favourite just ahead of Thomas Darby and Al Dancer at 10/1." The six-year old, who finished second in the Grade 1 Betway Challow Novices' Hurdle at Newbury last month, is one of three runners entered by Betfair Ambassador Nicholls, with Grand Sancy and Mont Des Avaloirs also in at this stage. Al Dancer, one of five entries for Nigel Twiston-Davies, is 10/1 second joint favourite in the Betfair Sportsbook market, alongside Thomas Darby, trained by another in the Betfair stable, Olly Murphy. Five times race winner Nicky Henderson has entered four horses (We Have A Dream, Apple's Shakira, Style De Garde and Countister). Gary Moore, who has won the Betfair Hurdle three times, has entered Sussex Ranger, Distingo, Not Never and Ar Mest, while Mohaayed, winner of the Betfair Exchange Hurdle at Ascot at Christmas, is one of seven trained by Dan Skelton. There are seven entries from Ireland, including five from the stable of Ireland's champion jumps trainer Willie Mullins: Uradel, Dolciano Dici, Cut The Mustard, Sayar and Saglawy. Betfair Spokesman Barry Orr said: "As you would expect for the richest handicap hurdle in the UK, entries are strong and once again improving novices are to the fore in the betting. "The Paul Nicholls-trained Getaway Trump, who will be putting the form of his splendid second in the Challow to the test, is 8/1 favourite just ahead of Thomas Darby and Al Dancer at 10/1." The weights for the Betfair Hurdle will be revealed on Wednesday, January 16. 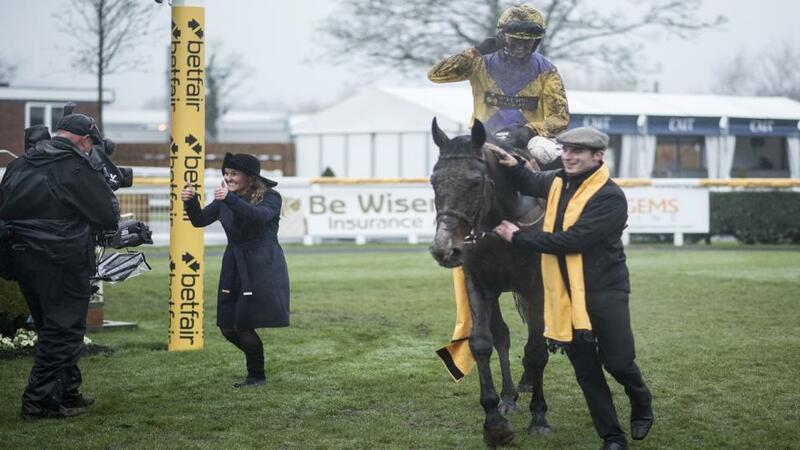 The race is part of Betfair Super Saturday, which aside from the Betfair Hurdle, also features the £50,000 G2 Betfair Denman Chase, a leading trial for the Cheltenham Gold Cup and the £50,000 G2 Betfair Exchange Game Spirit Chase over an extended two miles.